1. Don’t Go Out 2nite. Sometimes, if you report on an area for long enough, you may start to feel you have covered everything that local news is going to throw at you. You think you’ve seen it all after wafer-thin general elections victories and gory serial killings over the years. Yet there is always something that will catch you by surprise in a news patch like Camden. This year it was rioting. The events myself, Tom Foot and Dan Carrier witnessed during the battles for order in Chalk Farm Road and Camden High Street were unlike anything any of us had covered before. I hope our reports and analysis were grounded and sensitive, without losing the impact and drama of what became a frightening stand-off. Looking back, I think we did a decent job – not least for the live tweeting that reassured a few people that the Electric Ballroom was not, contrary to rumour, on fire. 2. Our Amy The news patch here is swamped with celebrities and the easiest thing in the world to do would be to take a Camden/Hampstead/Primrose Hill celeb from a news story printed in the nationals on Monday and Tuesday and jam it into our own pages. We try not to do that too much. Amy Winehouse was a little different. 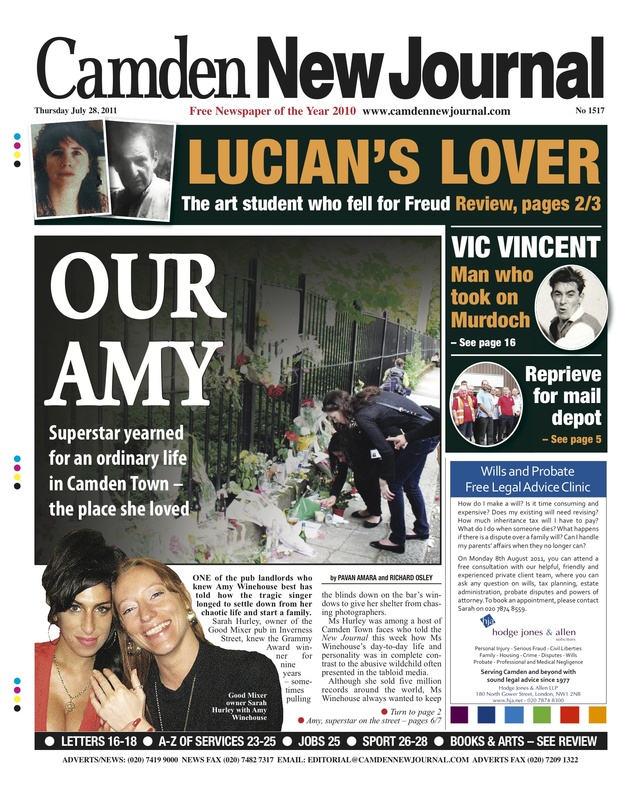 While we didn’t cover her tantrums and fights with the paps over the years, when she died in July we spoke to the people who saw her every day in Camden Town. Amy Winehouse wasn’t a celebrity who lived behind closed doors, she was living in our midst. In streets where everybody vaguely knows everybody, this wasn’t just a world famous singer dying, it was someone people in the market knew, people in the cafes knew, and, yes, people in the pubs knew. They connected with her because she gave them the time of the day and understood a different side to the spitting tabloid caricature everybody else blamed for her own demise. That’s what was behind the headline: Our Amy. 3. 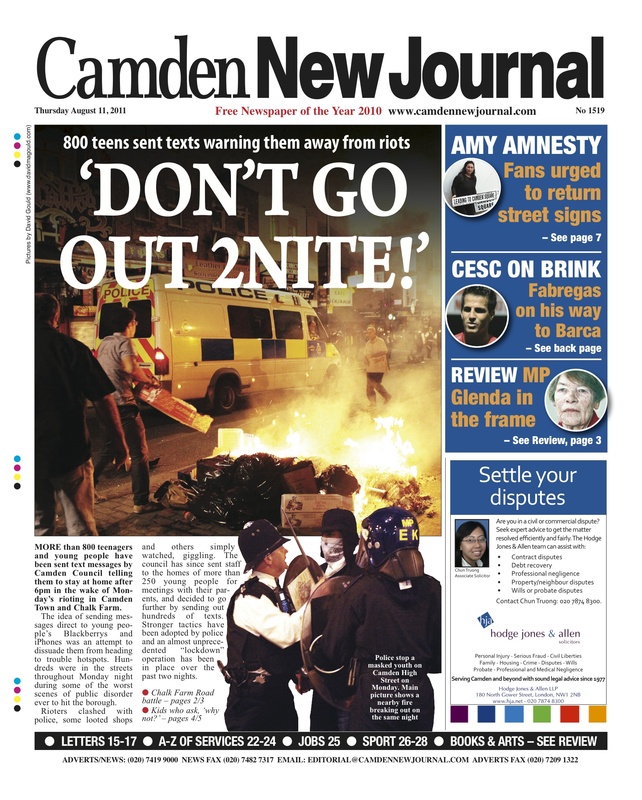 It’s Camden Lock In 2014 The great Camden Fire of February 2008 seems a long time ago now. While the ferocious flames which temporarily closed the Hawley Arms and destroyed the canalside Hawley Wharf are now tales of the past, the argument about what should be built on the site runs on. Dan Carrier’s news spread in June was the first to reveal what developers want to put there. 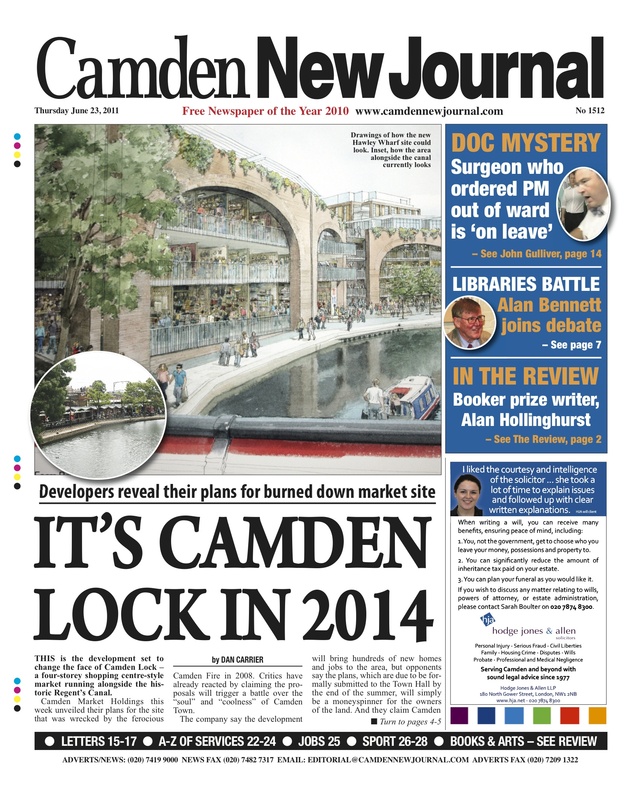 People have been hotly debating whether its what Camden Town needs on one of its core site ever since. 4. Don’t Do It! 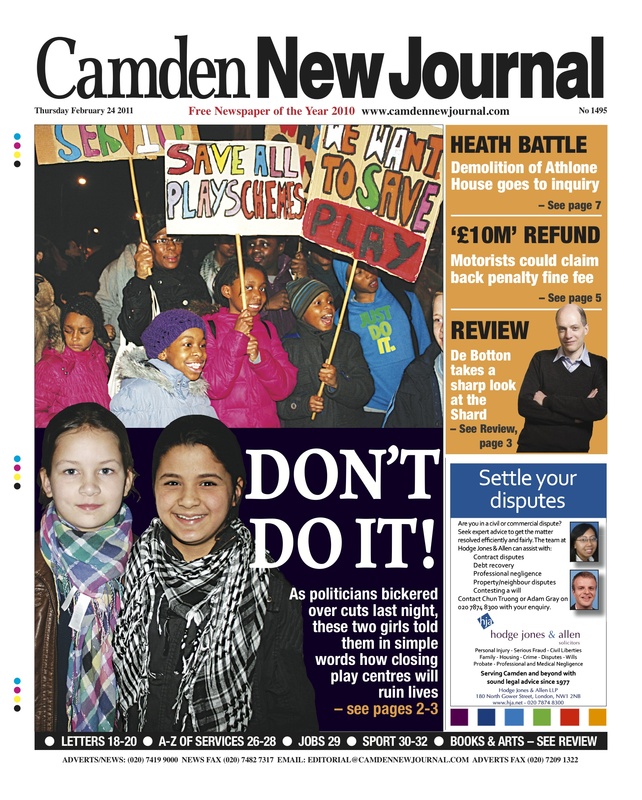 There have been plenty of debates in Camden’s Town Hall about how the cuts will fall and who is to blame. A lot of the sessions have been little more than political point-scoring bouts. It’s circular. Labour councillors blame the government for the cuts. Conservatives and the Lib Dems blame the old Labour government for the deficit. In the middle of this bickering, two girls spoke in the council chamber more eloquently than some local politicos about how crunching youth services will only lead to catastrophe. 5. 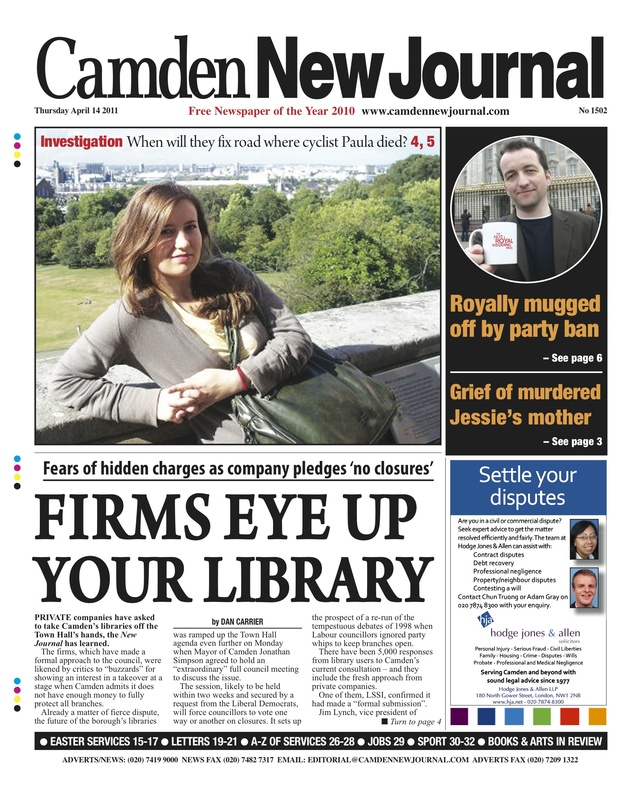 Firm Eyes Up Your Library Although all the campaigning on libraries has been interesting – just look at how much money they have already raised in attempts to save Chalk Farm Library in recent weeks – this front page is picked for the picture of Paula Jurek, the cyclist killed in Camden Road. Inside was an investigation into claims that safety improvements on the road where she died were delayed because of concerns they would slow down buses and other traffic. Reports and recommendations had not been acted upon. Sadly, Paula was not the only cyclist to die on her bicycle in Camden this year and there was that churning feeling of history repeating itself when fashion student Deep Lee was killed a few months ago in King’s Cross. Again, there were questions as to why safety improvements at the spot where she died had not been carried out. Hopefully, pledges and promises in the run up to May’s London elections will lead to safer roads for cyclists. The story is too familiar. There was a first outside the Electric Ballroom, which was then mis-tweeted as the EB being on fire (was inside venue at the time, taking refuge). But a true showing of the important (and non-mundane uses) of social media by CNJ journos on the night, which I think everyone locally appreciated.